MUSKEGON, MI – – A friend and I sat at water’s edge recently watching Lake Michigan waves roll thunderously onto the beach. They ran up the sand with the power of a freight train, pushed by the gale that had blown the beach smooth. Indeed, that is what would happen. The question struck home. I had just spent two days in Saugatuck at a conference about the Lake Michigan Water Trail. That’s the 1,200 mile route being developed around Lake Michigan — an ambitious four-state project with much to offer paddlers and local communities. The latter are expected to gain from the economic benefits of increased tourism. Those benefits, by the way, are expected to amplify with the parallel development of a cycling route around Lake Michigan and the revival of the Circle Tour motor route. The branding implications seemed abundantly clear — a case of “build it and they will come.” Paddlers down south, for instance, who might have heard of Lake Michigan but never thought to visit, would suddenly have reason to consider it. They might bite off a small piece and paddle or cycle a segment, stay in local motels and/or camp. Or, they might go for the gusto as Mary Catterlin and Amy Lukas did this past summer. The 23-year-old paddlers from Indiana circumnavigated Lake Michigan in an 11-foot dugout canoe. Catterlin had crafted it in her parent’s backyard by hollowing out a log. Both young women had come to the Saugatuck conference where Gary Mechanic, the administrator for the Lake Michigan Water Trail Association, mentioned two others he knew who had circumnavigated the lake. The waves in front of us were ominous and threatening. I couldn’t imagine being out there by choice. I was, however, struck by just how far things have come. When I came to Grand Rapids in 1987, there were no kayak dealers in West Michigan. Sea kayaking was relatively unknown here. Paddlesports since have taken off, and water trails now are being developed across the nation. The demand for them has been clear. Some of those supporters came to Saugatuck. There were paddlers who hope to enjoy the trail, paddling outfitters and guides who hope to make money off it, trail organizations looking to grow, and surrounding state DNR representatives, along with Pure Michigan tourism and national park service officials. Even Michigan DNR staffers seemed to endorse the concept — a huge change from the past — but time will tell whether their interest is sincere. Michigan officials have been more likely give water trails lip-service, but find reasons not to make any progress. Wisconsin DNR, meanwhile, has proven itself a leader. “We are taking on the role to establish more water trails,” said Jeff Prey with the Wisconsin Department of Natural Resources. Prey said their value, socially and economically, is recognized at the highest levels of state government. Michigan, on the other hand, has hidden behind alleged “safety and liability” concerns — a specious argument in my estimation. The portrayal of water trails as dangerous is little more than a smokescreen. That reticence historically came from being unfamiliar with paddling and the lack of a funding for water trail development. The agency focused instead on rail trail development, where demand and money both were readily available. It also has invested millions in its Harbors of Refuge, a program again with funding, which built harbors every 30 miles so boaters have a safe place to go. Yet boaters continue to make mistakes, and I have yet to hear someone suggest that they not get built because of it. Risks, after all, are understood to be on the user’s shoulders. It doesn’t matter whether you snowmobile across the Upper Peninsula, boat across Lake Michigan or paddle around it. Paddlers, like boaters, need to make judgment calls any time they go out. There always will be some who lack good judgment. So, as we watched the waves scour the Lake Michigan shoreline this day, and as flying sand threatened to score my eyeballs, I looked out over the vast, tumultuous expanse of water and was relieved to see not a soul. 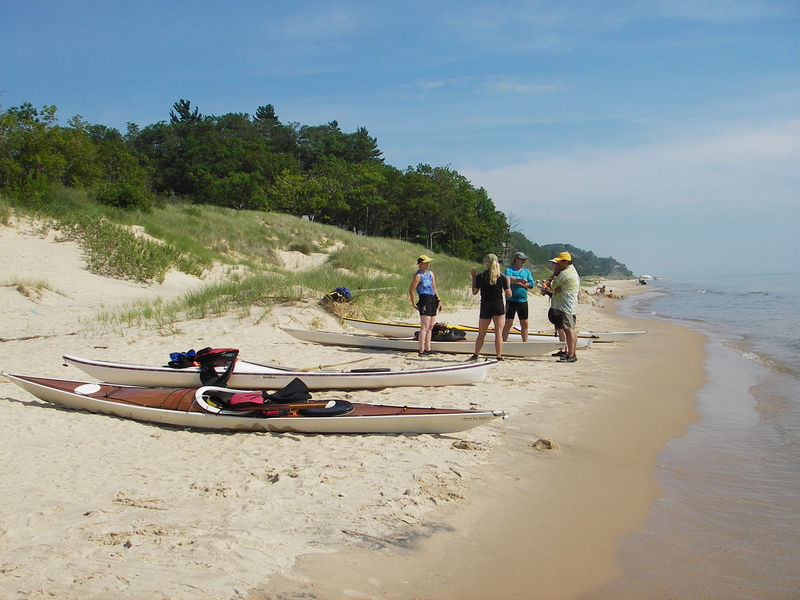 This entry was posted in Uncategorized and tagged Canoeing, Coast Guard, DNR, Kayaking, Lake Michigan, Lake Michigan Water Trail Association, Michigan Department of Natural Resources, Paddling, Water Trail, Wisconsin Department of Natural Resources. Bookmark the permalink.